I had the displeasure of reading Inspector Gadget’s ‘Wasting police time’ book full of anecdotes of the thin blue line. One of the chapters I found highly enlightening was in regards to the ticking of detectable crimes. For the Police Service, they now not need a conviction to improve their statistics, they only need to identify the wrongdoer, go through the motions and then release the ‘perpetrator’ for another ‘successful’ detection. A prime example of lazy policing is from the Telegraph. Colin Furze, a plumber who adapted his scooter to shoot 15ft flames from the rear, has been arrested for an alleged firearms offence. 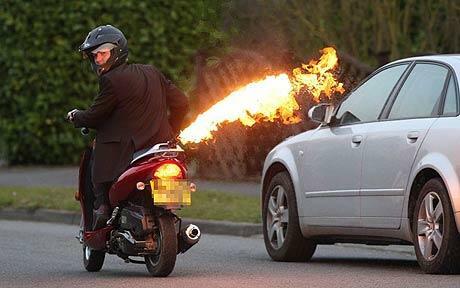 Mr Furze, 30, displayed his modified his scooter, with an anti-tailgating flame thrower operated by the flick of switch, in the press earlier this week. But Lincolnshire Police spotted the pictures of Mr Furze allegedly riding his scooter on a public highway – and arrested him on Thursday. He was held on suspicion of possessing an object converted into a firearm, and was released on unconditional police bail without charge until May 6 pending further police investigation. Possession of a firearm carries a maximum prison sentence of five to seven years at Crown Court. Mr Furze, from Stamford, Lincolnshire, declined to comment. Speaking before his arrest, he said: ”Everybody wants a flame thrower on a motor bike. The scooter, which was built before Christmas, was Mr Furze’s third attempt at the project after the first did not ignite and the second burst into flames. So the hard-work of spotting pictures in a national newspaper leads to the arrest of a James Bond enthusiast? Is this how Lincolnshire Plod spend their day, going through the publications trying to spot misdemeanors? Still, at least Lincolnshire Police have another ticked box in the ‘fight against crime’. With Policeman like these, who needs criminals. The Establishment busy conditioning the population to oncoming Police State or a step in the right direction towards utopian paradise? Once upon a time, the filth used to need a very good reason and a warrant to enter your home, or at the very least, be invited. Now though, some seem to have the right to climb through an open window, wake up the occupants and then proceed to berate them on their lack of a moat, pack of Doberman guard dogs and a 30ft watchtower with a 500 watt rotating search-lamp. Because if we all took an active duty in fortifying our homes at all times, we can then obliterate the crime of burglary, thus giving the Police extra time to combat all those ex-burglars now making a living through ‘forced-entry burglary’ (they will adapt, I assure you). Unlawful – Firstly, the Police have no right to lawfully enter your property unless authorised by yourself or a judge. The moment they step foot inside your property, that is trespass and a criminal offence. Unless of course they want to hand out compensation at taxpayer cost. Health & Safety – Secondly, if the intruding Officer is taken for a real intruder and then injured, or even killed, the resident would be able to get away with it. Even if they are highly visible in the yellow fluorescents, the would-be defendant could plead that anyone can buy a police uniform. Alienation – Thirdly, in Iraq we were constantly told the British Army was trying to win the hearts and minds of the Iraqis so they would trust the Army more. Yet this police initiative will invite more alienation from the people it is meant to serve. Abuse – Like many powers acquired by the thin blue line, this will be wide open to abuse. Entering homes finding them unoccupied, whose to say evidence wouldn’t be planted for a future ‘visit’ or a few pieces of jewellery “the wife might like” goes missing. Whatever happened to the Peelian principles? In Our Glorious New Land, the NuPolice are the political stasi of NuGov. Another alphabet organisation so ‘political’ in creation that it supports every new law and power (and any other perk) NuGov suggests. So how happy I am for more evidence of NuGov-inspired corruption (sarcasm). The Association of Chief Police Officers are under the microscope in the Daily Mail with: “Body in charge of UK policing policy is now an £18m-a-year brand charging the public £70 for a 60p criminal records check”. The article is a lot more coherent than the title and is well worth the read although I will just point out the bleeding obvious. Selling information from the Police National Computer for up to £70 – even though it pays just 60 pence to access those details. Advising the Government and police forces – earning £32million of taxpayers’ money in the process. Wake up Britons! You are literally being robbed. This “Association” is a run-for-profit organisation that parrot the policies from their NuGov paymasters. That isn’t the policing protecting the innocent Sir Robert Peel had in mind. This is more like a made-to-order security operation protecting crooked government from the people! Another one of those Common “leading beyond authority” Purpose front groups that deserves the chop. And another reason to vote Nationalist this spring. NAMP is a Muslim organisation that welcomes the diversity of Islam and does not concentrate on any specific strands or sects of Islam (from HERE). One of the projects are for “Promoting Social Cohesion, Understanding local/National Government, Promoting public sector (where there is under representation) and of course, Esteem and Confidence Building” (from HERE). Another one of those so inclusive ethnic organisations that the EHRC loves so much. This grouping of Muslims may not take an interest in the various jihad and mujahideen happening around the world, preferring to wage war on the British National Party with the help of the Telegraph’s deputy political editor. Muslim police officers have rebelled openly against the Government’s anti-terrorism strategy, warning that it is an “affront to British values” which threatens to trigger ethnic unrest. In the official intervention, the association said the Government’s anti-terrorism policies could not “continue unchecked”. The comments, made in a seven-page memorandum to a parliamentary committee investigating extremism, are embarrassing for Gordon Brown. They indicated that Muslim officers may be reluctant to take part in “hearts and minds” anti-terrorism campaigns. The organisation, which represents more than 2,000 officers, was previously publicly backed by Mr Brown. The Prime Minister said the association was crucial to bridge the historic divide between Muslims and the police. There have been growing concerns about the radicalisation of Muslims in Britain. The failed Detroit bombing on Christmas Day was carried out by an al-Qaeda-inspired extremist who had studied in London. The Daily Telegraph disclosed last week that American intelligence agencies believed that Britain had the greatest number of Islamic extremists of any Western country. It is thought to be the first time that the Muslim association, which was founded in 2007, has criticised government policy. In an analysis of the Prevent strategy, which is a set of policies designed to stop radicalisation, the organisation claimed: “The strategies of Prevent were historically focused on so-called Islamist extremism. “This has subjected the biggest black and ethnic minority community, and second biggest faith group, in an unprecedented manner, stigmatising them in the process. “Never before has a community been mapped in [such] a manner . . . it is frustrating to see this in a country that is a real pillar and example of freedom of expression and choice. The association warned there were “echoes” of the racism of the 1970s and 1980s which led to inner city riots. “We appear to have ignored the lessons learnt from these dark days,” the officers said. There is growing criticism among Muslim groups of the government strategy, which was welcomed by mainstream police organisations. The policies are aimed at stopping Muslims from becoming radicalised through measures such as sponsoring moderate community groups. Ministers insisted that the strategy, which costs more than £140 million a year, had “real successes”. More than 200 people were convicted of terrorist offences in the past eight years. But the NAMP claimed the policies had led to “hatred against Muslims” which “has grown to a level that defies all logic and is an affront to British values”. The organisation said Prevent should focus on confronting far-Right extremists such as the BNP. The memorandum warned that Muslims were subjected to “daily abuse” due to the strategy. “We must not diminish our British values further by continuing to allow such behaviour and polices to continue unchecked,” it added. Research by “those convicted of terrorism acts shows Islam was not, and is not, a real driver but all our strategy seem to focus on is this un-evidenced view of Islam being the driver,” they said. The Government said that confronting Islamic terrorism was one of the key priorities of the anti-radicalisation strategy. Last night, the Foreign Office admitted that funding for counter-terrorism policies in Pakistan had been cut. A spokesman from the Department of Communities and Local Government said: “The idea that we only focus on Muslims on terror issues is completely false. The Fabian-inspired mass-cultural-influx on these British Isles, especially the dumping ground in the south, is just a harsher form of gerrymandering. All these special interest groups fighting for their respective corners and the Government reckons this is good for cohesion? Of course it isn’t. It is good for Divide & Rule though and the Bastards know it. Tragically, these newcomers think they will inherit this land when in fact they too will be sent to the slaughter. Another Muslim organisation blaming the British National Party for the faults of Islāmic Terrorism. “If only they stopped highlighting the religion of peace, the sooner we can hold hands and make babies” bullcrap they sprout is unbelievable. And this is meant to be a so-called “independent voice of the British community”, proclaiming that all the world’s problems rest at the feet of Nationalists. 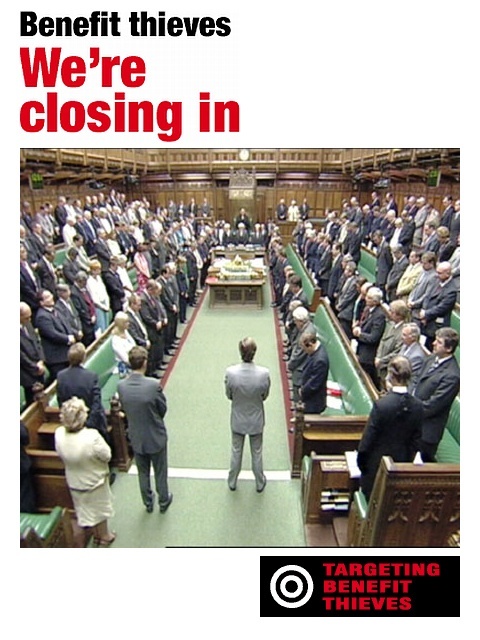 See how much the Establishment fear the BNP? Operation Black Vote, Hope not Hate, Rise, Searchlight, UAF and all those affiliated with it do so for it is in their interest to keep the misery going. A few profit from it, others get free promotion while a few are plain degenerates who a hundred years ago would be in a padded cell (Tara ‘the bloke’ Tarquin). If the Tories, Labour, Liberal Democrats along with the groups above don’t want you to vote BNP, do you think they have your interests at heart? Or their own? Judging by their history, none of these unsavoury organisations have my trust. Especially the Three Stooges, for we are nothing but commodities to them, to be bartered with on the global market. We are no more than consumers at best or cannon fodder at worst for the Bastards that Be. So do your Nation a favour and vote , the only medicine strong enough to cure Britain’s ills. They had the foresight to see that tyranny can come from Ones’ Own ‘Government’. Oh I so admire their “Right to Bear Arms” – us poor sods have to rely on the Police as the Government have not only outlawed personal firearms but even BLOODY self-defence for Christ’s sake! What the heck is reasonable force? Someone tries to thump me, I’ll thump them back till I’m safe, I’m not going to take a break every 30 seconds to check if my ASSAILANT is okay am I!?! Wasn’t it Lenin who said, “One man with a gun can control 100 without”? And the very WORST thing about the Police in NuLabour’s era of “Peace in Our Time”, is the Management (ACPO) are employed and rewarded by the Policheatingscumbags and so has total discretion in who to investigate. Want proof. A senior police surveillance officer who admitted tampering with his evidence during the inquest into the death of Jean Charles de Menezes was cleared today by an official investigation. Parallels have been drawn between the controversial Peach case and the death in April this year of Ian Tomlinson, a newspaper seller who was on his way home during the G20 protests when he was attacked from behind and knocked to the ground by a police officer in riot gear. To date, no-one has been charged. The Police now protect the Crooked MPs who appoint them. All Police Chiefs need to be elected by the people, otherwise this will continue to happen. Because if the Police has been compling with the Government, then the question is “Who will protect us from the Protectors?” Will Iraq return the favour? Our friend in Europe, whoops, that should be the European Council, will they come over and “return democracy”? Hell in a hand-basket? More like we’re skipping with a stupid smile of disbelief. How the bloody hell did we become like this!?! And if any Police Officers of good heart and of high moral character read this, please do not be offended, this is intended to show my disgust of what our “Political Betters” has done to this Nation. They have opened us to hell and more. If only some Peacekeeper had the means to stop those who would destroy us. Or even a military coup would be preferable to the NuLabour Regime. It’s like being in some dystopia movie with all the large numbers thrown around and dictate after dictate… it won’t end until we are ALL completely dependent, not on the Nation or the State but the whims of select few maybe, a few dozen at most. Who lives, who dies. And then one day good-hearted and of high moral character Public Servants and Protectors, when you are no longer needed, will you stand up then? "Sure... we'll make sure your looked after"